Buying baby gifts or baby clothing for your own child is always a fun treat. But if you can help a good cause and other babies around the world at the same time, the purchase is even sweeter. There are several companies who make it their mission to help others in need through the adorable baby items they sell. So whether you’re shopping for a baby shower, birthday or your own little one, check out this list of baby clothing gifts that give back. First on the list is Baby Teresa, named for Mother Teresa and whose tagline is “buy once, give twice.” For every romper that is purchased, Baby Teresa donates another one to a baby in need somewhere around the world. For their other baby items, like bibs, hats and blankets, Baby Teresa donates 25 percent of profits to “charities that empower women during pregnancy, birth and parenthood” around the world. The company was founded by two moms in Australia in 2009; and since then they’ve donated baby items and money to more than 20 countries. 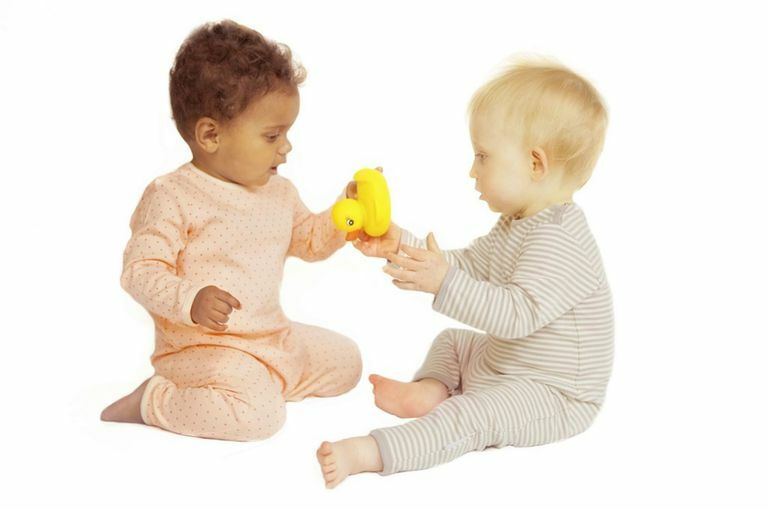 All of Baby Teresa’s baby wear is made of 100 percent fair trade organic cotton, which is super soft and cuddly. The three romper designs available (in both bodysuit and sleeper styles) are named after children that the company has met throughout the world: pink polka dots is named for Ruby in Uganda (romper seen here), beige stripes is named for Jimmy in Indonesia (romper seen here) and blue polka dots is named for Son in Vietnam. 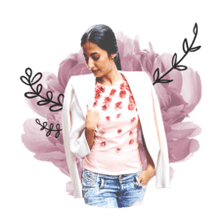 Pebble by Kahiniwalla was designed by Samantha Morphed, a social entrepreneur in Bangladesh, who created workplaces in rural parts of her country where women could work close to home and not have to leave their families to find work in cities where they would be vulnerable to unsafe situations. These women make the Pebble collection of baby and toddler products that includes adorable hand-knit and hand-crocheted hats, rattles, dolls, stuffed animals, Christmas ornaments and cars. Book lovers will adore Out of Print T-shirts for babies and toddlers that feature the covers of children’s literary classics like “Goodnight Moon,” “Madeline,” “The Very Hungry Caterpillar,” and “Corduroy.” Each purchase helps fund literary programs and book donations to communities in need. Made in Kenya, Wildlife Works T-shirts not only promote conservation of wildlife, but the company helps support wildlife reserves and endangered wildlife in Kenya and around the globe. Every dollar spent “goes directly to job creation and community development in rural,” wildlife-rich communities around the world. While working at Neiman Marcus in Dallas in 2009, Samuel Bistrian had a fateful meeting with Blake Mycoskie, founder of TOMS Shoes—a company that donates one pair of shoes to those in need for every pair of shoes purchased. Bistrian, a Romanian by birth who never forgot his impoverished roots, was inspired to use his retail fashion experience to create Roma Boots in Dallas—a company that also donates a new pair of boots to a child in need for every pair of boots purchased. This colorful pair of rain boots are named for one of Bistrian’s daughters, Ilona. Three male snow sports enthusiasts learned to crochet knit hats in high school and were dubbed the Krochet Kids after they started selling custom hats in their hometown of Spokane, WA. Years later after traveling the world, they started a non-profit business where they’ve taught numerous impoverished Ugandans and Peruvians to crochet. They now employ more than 150 people who earn fair wages by making products and crocheting adorable hats, like this owl hat that’s crocheted in Uganda and hand-signed by the woman who made it. When you buy a cute elephant T-shirt from Nomi Network, you help provide jobs to survivors of human trafficking and help end modern-day slavery. With each purchase of Little Lotus products, like a swaddle or sleeping bag, the company donates Embrace Infant Warmers, which are portable, reusable and do not require constant electricity, to premature and underweight babies in developing countries. Most people are familiar with TOMS Shoes and its inspiring business model of "one for one;" for every pair of shoes that is purchased, TOMS donates one pair of new shoes to a child in need. Since its inception in 2006, TOMS has given a whopping 60 million pairs of new shoes to children in need around the world. Not only is it a great cause, but TOMS Shoes, especially its baby and toddler shoes, are super cute and stylish. So it's a win-win for everyone.